Plans to create England's largest wind farm in Cumbria have been rejected by the government. The £55m development would have seen 27 turbines, each 377ft(115metres) tall, erected at Whinash, near Kendal. A six-week public inquiry last year heard from campaigners who said the project would destroy the landscape of the Lake District. Energy Minister Malcolm Wicks said he agreed with the inquiry inspector that the plan should be thrown out. Environmental groups such as Greenpeace backed the clean energy plans, but campaigners were worried about the visual impact on the countryside. The turbines would have occupied a 9-hectare (22.25 acre) area stretching between the Yorkshire Dales and the Lake District National Park, close to the M6 motorway. 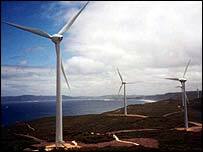 Chalmerston Wind Power and the Renewable Development Company led the proposed project to build the turbines, which would have generated around 67 megawatts of electricity. The Cumbrian Tourist Board was amongst those opposed to the plans and naturalist David Bellamy vowed to chain himself to the turbines if building went ahead. Mr Wicks said: "Tackling global warming is critical, but we must also nurture the immediate environment and wildlife. This is at the crux of the debate over wind energy. "On this occasion, we agree with the independent inspector that the impact on the landscape and recreation would outweigh the benefits in terms of reducing carbon emissions. "I know there was both support and opposition to the Whinash development, but I hope the winner here is the planning system, which has to be robust in its assessment of the merits of each proposal. Our commitment to renewable energy is remains firm." Stephen Tindale, executive director of Greenpeace, said: "Any government that wants to expand airports and turn down wind farms is simply not fit to govern. "Climate change will ravage beautiful areas like the Lake District. I hope those responsible will be willing to explain to future generations how they played their part in allowing the savage grip of global warming to trash the countryside and claim hundreds of thousands of lives." Penrith and the Border Conservative MP David MacLean said: "The overwhelming weight of evidence at the public inquiry was against the Whinash wind farm development. "This is good news for Cumbria, for local people and all those who have been campaigning to prevent our precious Lake District landscape being destroyed by the wrong wind farms in the wrong places." Would you live near a wind farm?